As the year draws to a close, a number of faiths have special celebrations surrounding the theme of light. Most of the festivals, along with the Christian festival of Christmas, have at their heart, the themes of light, celebration, a new dawn, travelling and hospitality. Here in the UK, our High Streets are full of shoppers seeking special gifts for their loved ones. This raises a bigger question of the impact these festivities have on our environment as so much is imported, and so much food goes to waste. All these questions and issues are addressed in our key values as the European Green Pilgrimage Network in terms of hospitality, welcome, journeying and the environmental impact. The journey for the EGPN this year has been a significant one as three of our partners form part of the Interreg project launched here in Canterbury in May. We have also said 'au revoir' to Alison Hilliard, who is now part of a bigger project at Wilton Park, but is still informed about our developments. Without Alison’s sterling work, determination and commitment to promoting the EGPN, we would not have this opportunity to develop our network while also furthering all that is good about Green Pilgrimage. I send my good wishes to all the partners, and we will be contacting everyone in the New Year regarding plans for 2018. We have learned much over the last year from out companion countries and those who travelled with us thus far. On December 29, we will be commemorating the death of Thomas Becket with a special evensong in Canterbury Cathedral. Since his death in 1170, many pilgrims have made their journeys to Canterbury, as they will on December 29 too. This is why the EGPN is so vital in promoting pilgrimage with an environmental conscience. With my prayers and blessings for the coming year. Members of the Green Pilgrimage Interreg Europe Project visited Romania in September on a study trip aimed at sharing experiences and best practices. 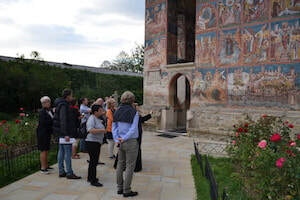 And members certainly had plenty to ponder after the five-day trip which highlighted Romania's rich relationship between heritage, culture and faith. 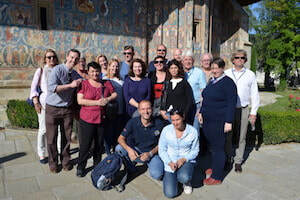 The study visit was part of the five-year, €1.18 million Green Pilgrimage Interreg Europe Project which brings together six regions in England, Italy, Norway, Sweden and Romania to promote green pilgrimage. 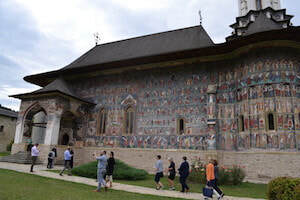 ​Participants learned about the importance of tourism and the development of cycling routes and pedestrian trails in Bucovina, particularly around the area's famous painted monasteries (pictured above), several of which are UNESCO World Heritage sites. His Eminence Damaschin Dorneanul, Archbishop of Suceava and Radauti, gave an overview of the history of religious pilgrimage in Romania (which includes Orthodox and Catholic faiths). Field trips included visits to St John, Suceviţa and Moldoviţa Monasteries (all UNESCO sites) as well as the black pottery centres of Marginea and Rădăuți, and participants also had the chance to take part in a walking pilgrimage. EGPN member Rev Berit Lanke gave a presentation on her experience of the different approaches to pilgrimage between Catholic, Anglican and Orthodox churches and her own Lutheran tradition. But, finding herself standing all night in the church, she realised 'the big achievement here was not me walking far across mountains with my backpack but it was a holy moment of encounter with the Holy God and Saviour, the holy Saint and Saints.' You can access her presentation here. This year's Pilgrimage took place on June 24 and welcomed the first woman diocesan Bishop, the Rt Revd Rachel Treweek, and the Dean of Christ Church, Oxford, the Very Revd Prof Martyn Percy as guest preachers. Attracting thousands of pilgrims and spectators, the weekend was a wonderful celebration of the city’s namesake. St Alban died on June 22, over 1700 years ago. He was executed for giving shelter to a Christian priest, Amphibalus, who was fleeing persecution by the Romans. history, the story of St Alban and St Amphibalus are integral to our Heritage Lottery funded project, Alban, Britain’s First Saint: Telling the Whole Story. We are linking with a group called Refugee Tales (organised by the Gatwick Detainees Welfare Group), who are seeking to organise their annual pilgrimage to Westminster, this year beginning from St Albans on Saturday July 7. Our Alban Pilgrimage will take place on Saturday June 23. Our Easter Monday Pilgrimage will be on Monday April 2. ​Further information on the pilgrimages and the ABFS project will be on our website in the New Year: www.stalbanscathedral.org. There is great potential for sustainable development along the St Olav Way, especially on its eastern route from Sundsvall in Sweden to Stiklestad in Norway and Nidaros Cathedral in Trondheim. Small and medium sized entreprises (SMEs) on both sides of the border are combining their strengths to create a chain of eco-friendly industries to enhance the pilgrims' experience. After a five-year project to create a coastal pilgrim route from Egersund in the South of Norway to Nidaros Cathedral in Trondheim, the collaborating County Councils along the coast have formally submitted an application to the National Pilgrim Centre to be acknowledged as an official part of the St Olav Ways. The decision is expected to be made official around Easter 2018. The Coastal Route brings a whole new element to pilgrimage in Norway, basing its travel by boat and not by foot, though there are stretches along the route that also cover land. Norway's Minister of Culture Linda Hofstad Helleland (pictured above) invited key representatives of faith groups, volunteer organisations, tourism and industry to join her on a pilgrimage from Oslo to Trondheim this summer. The pilgrimage included walks, talks, concerts, food and meetings with local communities. Afterwards the Minister announced that she intends to review the National Pilgrimage Development Strategy. Her aim is to strengthen political support for culture and cultural heritage, with a strong emphasis on sustainable development and mutual collaboration between faiths, organisations and industry. The review is expected to be launched early 2018. The St Olav Path (St Olavsleden) is one of the St Olav Ways leading to Trondheim. The 565km path goes from coast to coast through both Sweden and Norway and is the second most popular path for pilgrims walking to Trondheim and Nidaros Cathedral. Now Nidaros Pilgrim Centre, the Stiklestad Pilgrim Centre (both in Norway) and the congregation of Selånger in Sweden are joining forces to apply for an Interreg EU-funded project. Selånger marks the start of this path, and is now building a brand new pilgrim centre (pictured above). The aim is to build closer links between these three key points on this pilgrim path, and to further strengthen bonds across the border. We also want to collect and document more of the historic knowledge as well as better communicate all the interesting cultural heritage and natural features along the way. Norway has the benefit of a strong network in the shape of the public/state programme for The St Olav Ways, with the National Pilgrim Centre as the lead coordinator. Both Nidaros Pilgrim Centre and Stiklestad Pilgrim Centre are part of this network and we hope that the years of working with the St Olav Ways has given us knowledge and experience that this new partnership can benefit from. The plan is to submit the application in February, so we are working intensively on all the details. ​To be continued! Norwich Cathedral in the UK is working to re-establish a safe and attractive walking pilgrimage route between Norwich and the Shrines of Our Lady of Walsingham as part of a broader ambition to develop a network of recognised historic routes to Walsingham. Pilgrims have been coming to Walsingham since 1061 and today the Shrines (Anglican and Roman Catholic, with significant Methodist and Orthodox centres) attract some 300,000 visitors each year to this small and remote village. Almost all travel by coach and car. While the environmental impact on an ancient natural and architectural environment is significant, pilgrims tend to spend little outside the shrines and in the community. Bringing foot pilgrims to Walsingham would broaden the demographic profile of pilgrims and boost the local economy. Where pilgrimage routes have been re-established in Britain, organisers have sensibly tended to stitch together existing public footpaths. In this case, no such rights of way survive: the route is almost entirely on metalled roads. The first order of business, therefore, is to commission a survey of land ownership along the route and to seek agreements to establish permissive road-side or cross-country routes. We are applying for funding to allow this survey to go forward. ​In addition, we are seeking to build working partnerships with parish churches, community councils, and local businesses to help create an infrastructure to support the needs of pilgrims on the route. We are also building up partnerships with local nature, conservation, and heritage bodies to establish a broadly based community of interest to support this development. In addition, Norfolk County Council is working with the Shrines and other local interests in Walsingham to ‘green’ the present pattern of pilgrimage. After four years of study and a year of painting yellow arrows along 931 km in Northern Italy, the Via Postumia has launched as a new path in the network of St James Routes. The Via Postumia's route connects nine World Heritage sites as it crosses from East to West in Northern Italy on an ancient consular route long used by pilgrims to Jerusalem and Santiago. Conceived by Postumius Albino for military purposes, its origins date to 147 BC. The project to reopen the long forgotten route started in September 2013 when Andrea Vitiello was attending the World Meeting of Associations of Saint James in Krakaw, Poland. routes and 'thanks to the advice and opinions of scholars and pilgrims, I began to recreate the steps of medieval pilgrims from the East', he explained. The Via Postumia's modern itinerary is based on the Itinerarium Burdigalense diaries. Starting at Aquileia on the Adriatic Sea and ending in Genoa on the Ligurian Sea, the route spans 930 km in 40 stages. From Aquileia to Piacenza, the itinerary follows secondary roads and cycling paths in fairly uninspiring terrain, but the route passes through cities of art such as Aquileia, Palmanova, Treviso, Vicenza, Verona and others. ​After Piacenza, the route becomes more uneven and the landscape opens to spectacular views and is feasible by bicycle. ​More information, including a guide to accommodation, is available (in Italian) from the website: http://viapostumia.eu, with some English language information available here​. The Japanese photographer Tomohiro Muda has an exhibition of photographs taken during two pilgrimages to Santiago de Compostela in Spain. Muda was born in in 1956 in the Prefecture of Nara, Japan, and has a fascination for pilgrimage. He has travelled the world photographing 'spaces for prayer'. This exhibition, held at San Esteban Chapel in Valencia, runs until December 29. The Way of St James has received another award to add to its list of international acclamations. The Aquí Europa-Vocento Award was presented to the Way of St James by Antonio Tajani, President of the European Parliament, for its important contribution to the image of Europe in the world. The award came as the Way of St James finished a programme to celebrate the 30th anniversary of its declaration as the First European Cultural Route.